When a young housewife is murdered, the cops find her troubled daughter guilty after she confesses to the crime - but was she really the killer? A woman discovers that her husband faked his death and assumed a new identity, while she struggled for 10 years as a single mother. A teen girl is stalked and harassed by a perverted man ten years older than she is, but despite help from her family, there's little the police can do to get rid of him. 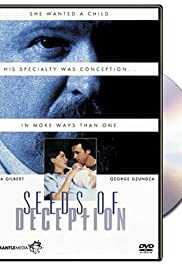 Melissa Gilbert is Mary Bennett, a housewife in Oak Ridge Virginia who becomes pregnant from the artificial insemination program of Dr Cecil Jacobson (George Dzundza). However Mary testifies in a fraud suit against Jacobson, accused on 46 counts of using his own sperm to impregnate patients. The teleplay by Phil Penningroth and Sharon Elizabeth Doyle, based on a true story, begins with Sue's story of Jacobson using the hormone HCG to create a false pregnancy, another fraud count. When Mary consults Jacobson, this sets up the expectation that she too will be duped, so when she gives birth it's a surprise. It is that her son Jesse (Michael Charles Roman) suffers from a lazy eye condition that other children of Jacobson's patients also suffer from that makes Mary question the identity of his donors. Although it is used to allow Mary a chance to talk about her experience, a talk back radio program's initial parody of Jacobson's behaviour scores a laugh. Director Arlene Stanford uses a bad music score by James McVay, black and white replays of previous scenes as flashbacks, and allows Reed to make as strong an impression as Gilbert.